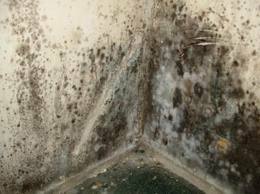 "Rising damp" on walls is caused by ground water moving up through a wall. 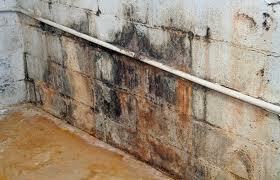 Most walls allow some water in, but it's usually stopped from causing damage by a barrier called a Damp Proof Course. This is usually a horizontal plastic or slate in the wall. If this is missing or ineffectual, your wall may suffer from rising damp. This type of damp can also happen when the level of the ground outside your home is higher than your Damp Proof Course, allowing water to get above it. Combination of the above will aggravate the situation. The hiding of rising damp by means of lath and plaster, aluminium paper etc., only creates a chimney effect, thereby forcing rising damp even higher than would normally be anticipated. The actual level at which moisture is visible is governed by the rate of evaporation from the inner surface of the wall. Here the moisture is evaporating from the wall at the same rate as the wall is absorbing the water at ground level. The use of impervious membranes or insulating materials as described above inhibits the rate of evaporating thus causing the damp to rise to a greater height. If you have Rising Damp you may notice damaged skirting boards and floorboards, crumbling or salt stained plaster and peeling paint and wallpaper. There may also be a tide marks along the wall. If you notice any symptom of Rising Damp give us a call on 077141 87053 or book your Free Survey and we will come and help you to deal with it. Why not just ignore it? 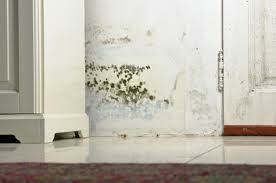 Rising damp can sustain a level of water in walls to such a degree as to stimulate the growth of wood destroying fungi. Skirting boards, joints, floorboards, architraves, door casements, window frames and all timbers used within the fabric of the building can be attacked. Plaster, bricks, mortar joints, decoration and wall coverings can be similarly seriously affected by the growth of dry rot fungus or associated moulds which start and then thrive in wet conditions. Without the presence of water, timber timber decaying fungi cannot develop.